Some time ago it was said that textbooks in Erevan gave much space to Western Armenian writers/poets. It is only natural, just as western textbooks featured writers and poets of the Erevan Province. One is incomplete without the other. As a testament the following is proof positive. Written in 1962 by Paruyr Sevak. Obviously it is about the genius of Petros Dourian. In addition he has reviews about ì³ñáõÅ³Ý, êÇ³Ù³ÝÃá, î»ñ»³Ý, ê³Û³Â Üáí³ and others. ØÇÝã»í ã³ÝóÝ»ñ Ï»ë ¹³ñ, áõ ã·³ñ Ù»ÍÝ ì³ñáõÅ³ÝÁ, áí± åÇïÇ Ï³ñáÕ³Ý³ñ ·ñ»É. àõñÇßÝ»ñÁ Ýñ³ ï³ñÇùáõÙ ÝÙ³ÝáÕ³Ï³Ý áï³Ý³íáñÝ»ñ »Ý ·ñáõÙ Ñ³½í³¹»å å³Ñå³Ý»Éáí ã³÷-ÏßñáõÛÃÇ »õ Ñ³Ý· áõªí³ÝÏÇ ï³ññ³Ï³Ý Ï³ÝáÝÝ»ñÁ£ Üñ³ ï³ñÇùáõÙ É³í³·áõÛÝÝ»ñÁ ËáëïáõÙ »Ý ï³ÉÇë, µ³Ûó áã ·áñÍ£ Üñ³ ï³ñÇùáõÙ ëÏëáõÙ »Ý ×³Ý³ã»É ³ßË³ñÑÁ, µ³Ûó ã»Ý áõÝ»ÝáõÙ ÙÇ ³ßË³ñÑ, áñÇ Ù³ëÇÝ ³ëí»ñ. ØÇ ³ßË³ñÑ, áñÇ ëå³éÇã ë³ÑÙ³ÝáõÙÁ Ï³ñáÕ ¿ñ ï³É »õ ïí»É ¿ ³Û¹ ³ßË³ñÑÇ ï»ñÝ ÇÝùÁ. Ü³ ã³åñ»ó ·áÝ» ³ÛÝù³Ý, áñ Ï³ñáÕ³Ý³ñ Ùáñáõë ³×»óÝ»É, áõ »Ã¿ ë»í³Ñ»ñ ¿ñ áõ ë»í³ÏÝ ÙÇ»õÝáõÛÝÝ¿. and why can't i read this? i don't see the Armenian letters in this topic. Arpa you can use [ FONT=Arial AM ] before the text and [ /FONT ] after it to make the text appear in armenian. Please note that there's no space after [ and before ]. Harut, it is written in Armenian NLS. I will try and experiment Garo's system even though I don't quite understand it. i.e is it just typing those words or would we also place them in brackets. I have had those fonts for sometime. Maybe Garo can show us the exact configuration.They don't appear in the transmitted text, so if Garo would use "dummies" ( characters that will nor hide but rather appear to show exactly how to execute I'll have to experiment. Something like [XXXXXX=xxxXXX] and [XXXX]?? In the meantime I find it much simpler to use the NLS system. Who else can/cannot see the Armenian text? Edited by Johannes, 26 July 2007 - 11:33 AM. In May 20, or June 12012 it will be the 160th anniversary of his birth. It is the belief of Henrik Bakhchinyan that Catholicos Vazgen I transferred the skull of Tourian to the museum so that the poet’s actual face features could be restored scientifically. The issue of what to do with the remains would be decided later. 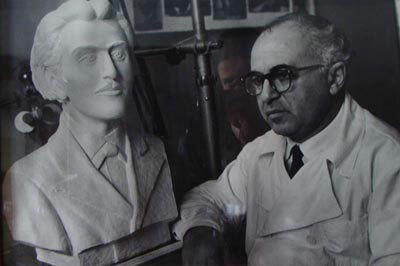 Academician Andranik Tchagharyan, an anthropologist and skull expert, got to work and successfully compiled a true image of Tourian’s face. A sculpture was also crafted. Tchagharyan then dismantled the skull and returned the bones to the museum. National fiasco on the eve of the poet’s 160th anniversary? For the past 18 years, Henrik Bakhchinyan has been waging a relentless battle with Armenian officials to have a few skull bones of 19th century poet and playwright Bedros Tourian interred in Yerevan’s Pantheon Cemetery. Mr. Bakhchinyan is Director of the Charents Museum of Literature and Art where the famous western Armenian writer’s remains are kept in a locked box. The bone fragments have remained in storage, seemingly forgotten, for years. During their tenures, Director Bakhchinyan had petitioned the previous two mayors of Yerevan to resolve the embarrassing matter, but to no avail. He has written letters all seven RA Minist16er of Culture since the country’s independence twenty years ago. This list includes the current Minister of Culture, Hasmik Poghosyan. None of these officials have taken any practical steps. Henrik Bakhchinyan says he prefers not to write to current Yerevan Mayor Karen Karapetyan, not that he has anything against the man, but based on 18 years of bitter experience dealing with government officialdom. “I’ve grown tired of being rejected. To be honest, I’m totally disillusioned. I’ll be leaving this position soon and I really don’t see this issue being resolved in any way,” says the museum director, adding that he and others are simply carrying out their sacred obligation regarding one of the nation’s greatest poets. Mr. Bakhchinyan says that the problem isn’t the lack of money but due to a lack of sensitivity regarding the significance of Armenian literature in general and the art of Bedros Tourian in particular. In short, it’s due to the fact that most cannot, or do not, appreciate Tourian’s art. Over the years, there have been individuals who have come forward ready to cover the costs of a burial. The expense would be minimal in any event – just a small plot in the Pantheon and a bust of the poet. “Some of our most famous intellectuals have been involved in this matter and all have declared that the remains of Bedros Tourian must be buried in the Komitas Pantheon and nowhere else. Recently, MP Viktor Dallakyan, a respectable individual, has taken up the cause. He made me some promises but, to date, nothing has resulted,” Bakhchinyan notes. 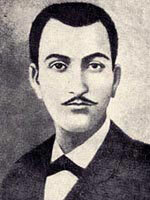 Bedros Tourian died in 1872, at the age of twenty, from consumption. He was buried in the Armenian Cemetery of Skudar in Istanbul. In the late 1960s, the Istanbul Municipality decided to build a road right through then cemetery and the problem of relocating the burial sites cam up. The Armenian Patriarch of Istanbul Archbishop Shnork Kalustian took the bold step to secretly remove the poet’s skull. Hiding it under a cassock, Patriarch Kalustian brought the bones to Etchmiadzin, presenting them to Catholicos Vazgen I. In 1969, Catholicos Vazgen handed them over to the museum for safekeeping. They’ve been there ever since. During his short and tempest-tossed life, Bedros Tourian was never photographed. The famous image we see today of Tourian was drawn based on the facial features of the poet’s mother and sister and recollections of friends. “We have a debt to pay to Tourian. The bones have been kept here for 40 years now. They aren’t an object for display but sacred remains. As such, they deserve a proper resting place in the homeland,” argues Bakhchinyan. Melinya Yeghiazaryan, Director of the Memoirs Division at the Museum’s Literature Department, shares this view. She’s been working at the Museum for 34 years, over which time 6 directors have come and gone. Mrs. Yeghiazaryan told me that all of them left no stone unturned to have the poet’s bones interred at the Pantheon. Once a week she burns incense in the museum; a gesture of respect not only for Tourian but for the personal effects of other noted individuals. Henrik Bakhchinyan last visited the grave of Bedros Tourian in Istanbul aback in 1993. The cemetery was in good condition and had just been relocated a few meters off to one side. Others who visited the young poet’s grave afterwards also reported that the site looked fine. The museum director hopes that after Tourian’s bones are interred at the Pantheon, Andranik Tchagharyan’s bust, or a copy, will grace the poet’s grave. This reporter contacted Gayaneh Dourgaryan, who heads the Press Service at the Ministry of Culture, to see if they were planning to resolve this matter once and for all. Dourgaryan advised me to get in touch with Karo Vardanyan. She said that Vardanyan would answer on behalf of the Ministry. Now here’s where it gets a bit muddled. Karo Vardanyan is the Deputy Director of the Charents Museum and works for Henrik Bakhchinyan; at least on paper. But Vardanyan’s views regarding the Tourian “fiasco” differ from that of his boss. Vardanyan told me that the Culture Ministry had been ready to have Tourian’s remains interred at the Pantheon. Two years ago, at the behest of the Minister of Culture, a preliminary budget had been drawn up as to the expenses of a Pantheon burial. The expenditure report even included the cost of an urn for the remains to be buried in and that of a moveable stage for the envisaged literary memorial event afterwards. According to the estimate, the entire interment would cost around 350,000 – 400,000 AMD (about $1,000). A roundtable discussion took place at the Charents Museum in 2009 regarding the issue. Invitees included members of the Writers Union of Armenia, staff of the Yerevan State University’s Faculty of Philology, representatives from the Pedagogical Institute, and the media. Karo Vardanyan says that if the attendees had come to a consensus regarding the burial at the Pantheon, it would have happened. They would have given their consent to the project and a petition would have then been sent to the prime minister for his approval. Let’s remember that burial sites at the Pantheon are allocated by the government. “However, since that assembly failed to reach a consensus on the matter, the petition to the government remained on paper only. Imagine this, only two people at that conclave were in favor of reburial. One was Khachik Stambultsyan and the other was our museum director Henrik Bakhchinyan. You understand the problem, right? We couldn’t have submitted that petition to the government with just two signatures.” says Karo Vardanyan. According to Vardanyan, the others at the Tourian conclave also viewed the skull remains were also of medical interest and nit just a human object to be buries. He says many wanted to see if Tourian’s image could be restored from the skull, not realizing that such an experiment had been successfully concluded years ago. He went on tell me that one participant even suggested that a memorial be erected in the Tourian neighborhood located in the town of Avan and that the skull be buried at its foot. Vardanyan concluded by saying that since a majority consensus wasn’t reached it has been decided to form a government committee at a future jubilee celebration for Tourian. This body will review the matter and decide what to do. Should Tourian have two gravesites? Given that 2012 will mark Tourian’s 160th birthday anniversary, Vardanyan says he will remind the ministry to request that the government form such a committee. “This is a matter for just one person to decide, to say ‘let’s take the remains to the Pantheon’. Let’s not forget that Tourian’s grave remains till today at the Armenian cemetery in Istanbul. And it’s a special grave. For decades, lovers have met at the grave,” notes Vardanyan. He also doesn’t rule out that the skull should be returned to Istanbul in the same impulsive way it was brought to Yerevan decades ago. “Why should Tourian’s earthly remains be divided, especially when the grave of the poet is in the Istanbul Armenian cemetery? I wouldn’t like to see Tourian or anyone else have more than one grave. Why is it that we are removing all our traces from the world by constantly relocating them here?” Vardanyan asks, listing the names of other noted Armenians whose remains have been so “repatriated”. When asked if he wasn’t concerned that the Turks might destroy Tourian’s grave if the skull is returned, in the same manner that scores of churches and cemeteries have been obliterate in western Armenia, Vardanyan replied that such matters were out of our hands even though the Istanbul Armenian community keeps watch over and cares for the Skudar Cemetery. “Is it so wrong to preserve the remains in the museum? We will present the matter, in all its details, to the government committee formed at the poet’s jubilee in order for a correct decision to be made. The question remains – to bury or not to bury?” notes Vardanyan. The Charents Museum Deputy Director adds that if the government committee decides in favor of burying the skull bones, it must take place at the Komitas Pantheon. There can be no other place of reverence to honor the poet, Vardanyan adds, since Bedros Tourian is one of our nation’s greatest luminaries. Edited by Arpa, 03 May 2011 - 01:32 PM. YEREVAN. - A ceremony dedicated to the memory of beloved Armenian poet Petros Duryan took place in Yerevan’s Komitas Pantheon on Thursday.